Adrianne Smith, behavior analyst and co-owner of Creative Behavior Solutions in Largo, attended AHCA's Tampa public meeting Friday, April 5 with her client, 3-year-old Dominick, and his mom, Renee Capone. The state Agency for Health Care Administration has backtracked on its decision to cut Medicaid reimbursement rates for therapists who mostly work with children on the autism spectrum, but other changes are still on the table. 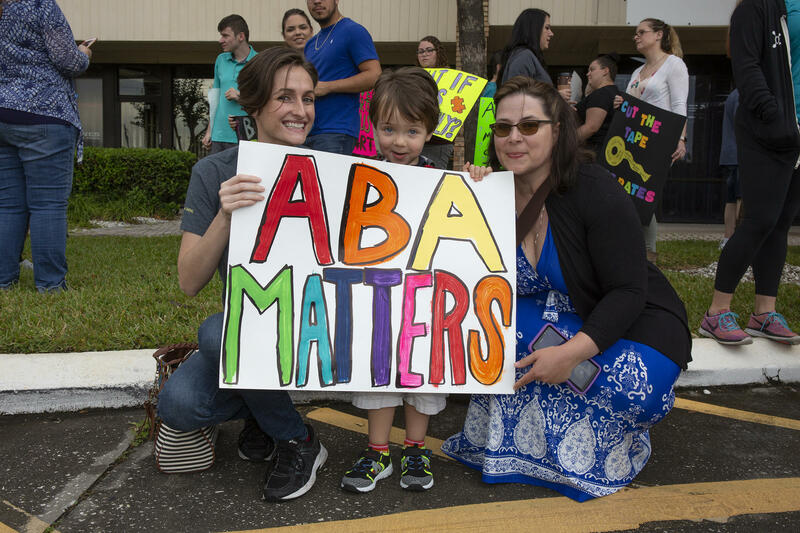 More than 100 behavior therapists and parents - several waving signs that said things like “Agency for Health Care Elimination” and “Not ok to cut ABA” - gathered at AHCA’s field office in Tampa Friday for the second public meeting in a series across the state through May 10. So many showed people showed up that AHCA held a second meeting right after the first one ended, to allow everyone who showed up the opportunity hear AHCA’s presentation and give their feedback. These reductions AHCA postponed were for a few different behavior assessments and provider types, but most notable was a 51% cut to reimbursement rates for registered behavior technicians - the largest group of people who provide behavior analysis therapy to children on the autism spectrum, under the supervision of a board certified behavior analyst. Kate Sallade, a board certified behavior analyst in Deltona, said she’s cautiously celebrating the rate cut postponement. “Historically, AHCA has shown us that postponing does not mean cancellation,” Sallade said. And if the cuts happen later, providers say many clinics will be forced to stop taking children who have Medicaid, which includes children who are some of the poorest in the state, or whose parents are self-employed. Bill Tingley, who helped raise his autistic granddaughter, feels conflicted on how efficiently AHCA will carry out their promises. "I am optimistic but concerned,” Tingley said. “Traditionally what happens is the intention is good but the execution is not what it means to be." Shevaun Harris, Assistant Deputy Secretary for Medicaid Policy and Quality for AHCA, told the people in the packed meeting room that the agency heard their pleas against the rate cuts, and is considering their concerns. But many providers are skeptical. Karen Wagner, a board certified behavior analyst in Brevard County, said AHCA’s communication efforts were dismal. The handbook is unclear about many policies, and changes were quietly put into place before public opinion was taken into consideration. "These changes came about before there was a conversation with the behavior analysts,” Wagner said. “There is kind of a lack of transparency, which is irritating." Many clinics are still struggling financially after payments were frozen in December, and because they can’t get Medicaid reimbursement for their mandatory supervision of behavior techs and the time it takes to do paperwork and write out assessments. “You wouldn’t expect your doctor to not get paid if a nurse is standing in the room,” Sallade said. Changes that will still take effect include GPS tracking of therapists and additional assessments either at the child’s home or by phone. Medicaid won’t cover reimbursement for those, and so it’s not mandatory for behavior analysts to attend. But the people overseeing those assessments may only be trained as social workers. “A social worker cannot trump the medical recommendation of a developmental pediatric specialist, neurologist, psychiatrist, psychologist that are required to provide the referral for ABA services in the first place,” Sallade said. The state will also partially lift the BA provider moratorium in Broward and Miami-Dade counties. And AHCA says they’ll be doing additional provider training for paperwork submitted to the agency. It’s not clear if people approving said paperwork will also be given additional training. Sallade, and dozens of other providers, have told WUSF that paperwork is bounced back repeatedly with requests for information that was already provided, sometimes on page one. Caseworkers approving or turning down authorizations for children to get ABA therapy don’t appear to have any training in behavioral analysis. The proposed changes come after AHCA starting cracking down on fraud in South Florida a year ago. Providers said the state’s efforts have backfired, resulting in authorization clogs, frozen payments, and credentialing issues that meant some children lost their services temporarily or permanently, while others sit on clinic waitlists. AHCA has repeatedly said that no child has or will lose necessarily services, but when Harris said that at the meeting, several in the audience shook their heads, indicating that wasn’t their experience. Pearson Klein, a board certified behavior analyst in Lutz, accused AHCA of looking down on ABA therapy. The next public meeting takes place Thursday, April 18 in Orlando. 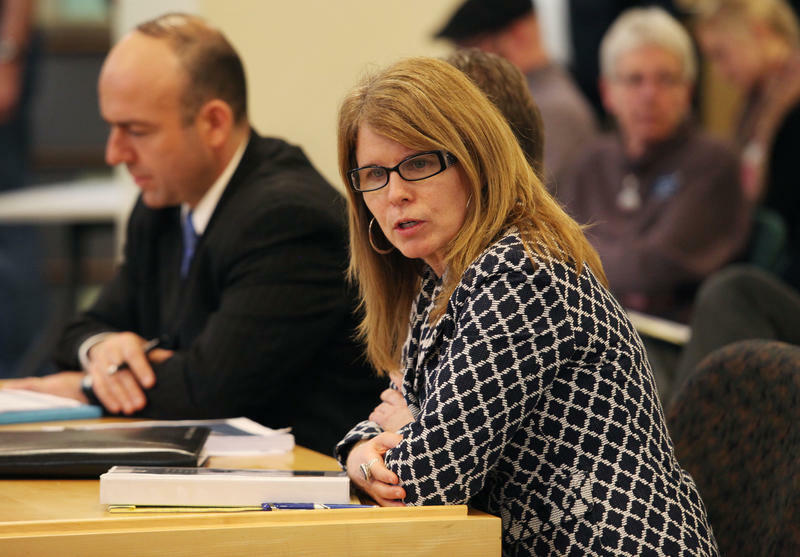 Governor Ron DeSantis’ pick to head the Agency for Health Care Administration, Mary Mayhew, passed her first Senate confirmation hearing Thursday. Mayhew briefly oversaw Medicaid for the Trump administration, and was over the program in Maine for seven years prior. Some Senators grilled Mayhew on her noted opposition to Medicaid expansion. For the second time this year, an administrative law judge Wednesday called for the rejection of a proposed pediatric heart-transplant program that would treat patients from Orlando and other areas of Central Florida.